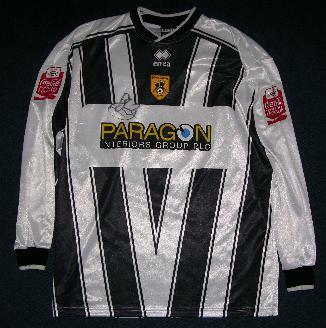 Notts County started life again in Division 2 (formerly Division 3) despite being relegated in the 2004-05 campaign, thanks to 'rebranding' by new sponsors Coca-Cola. This Pies were tipped to be successful and bounce straight back up again with many fans optimistic that Gary Mills was the man to give the club its first promotion since 1998. Unfortunately things did not turn out quite so neatly and the manager left the club in November 2004 after a depressing run of results that saw the club nearer to the bottom of the table than the top. The club then turned inwards for its next appointment by giving long-serving player Ian Richardson, a.k.a 'Mr Notts County' temporary charge. He went on to manage the team for 34 games, winning 11 of them, losing 14 and drawing 9. At the end of the season however he was relieved of his duties and the board decided to select a new outside man for the job. Many considered this poor reward for the Richo's efforts especially as his tenure brought some great moments. 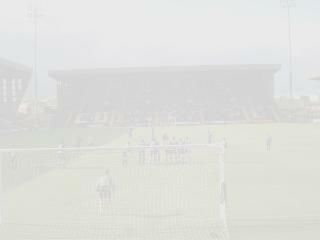 Under his leadership, the team had a reasonable cup run that saw a live broadcast of their victory over League One opponents Swindon on Sky before a narrow defeat against well-regarded Middlesborough.A glut of injuries, especially to the defence, ensured his record was not great but as May came,supporters and former manager could only reflect on what might have been. The unveiling of the new kit was later than normal and when it finally appeared, the 'V' shaped stripes caused some consternation amongst diehard fans. The club immediately insisted there was a traditional element to it - they'd worn a similar design in the past. Oh alright - we'll let you off then. The texture of the kits was very shiny - like the old eighties England shirts.Different I guess ! The sponsors had an old feel as well as the club welcomed back Paragon who had been with them in the 140th anniversary year for a two season deal. The shirts of the players were similar to the replicas and easily mistaken. The first thing to note is that every Notts player was only ever given 2 and as a rule one was long and the other short (although some had either both their shirts in long or short sleeve. The problem with differentiating the player issue comes because, unusually, long and short sleeve homes were sold in the shop. Along with the official lettering this made a very good copy of what the team were wearing - so much so that it can be hard to distinguish between the replica and the real thing. The main difference is the epaulettes which never went on sale, owing to availability and poor quality and so were only used for player shirts. These were a new design - from new sponsors, Coca Cola. The following season when they were sold commerically, they were made of felt rather than plastic and quite different in texture.The replicas, like the players, had blocks on the back for the name and number. At the end of the season the players were not allowed to take their kit home so they were left in the hands of the club. Some of the players who didn't make it to the final day saw their's go to auction site QXL whilst a few appeared in the club shop a month into the start of the following campaign for £50 each. The shirt of Glynn Hurst - one of the new generation to come in under Gary Mills when most of the previous team departed after relegation. 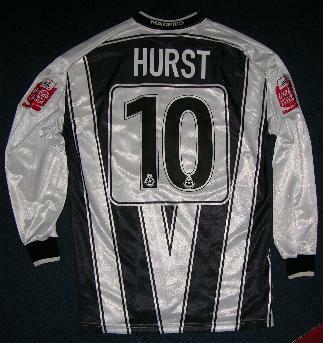 Although not universally popular, Hurst was the most successful of the short-lived Mills period and consistently produced goals for the inconsistent team. The wise owl who allocated his squad number must have had one eye on replica sales as well - giving him the number ten jersey to replicate his namesake, the World Cup hero of '66..
Gary Mills, who listed Coventry amongst his old employers, made sure there was a liberal coating of Sky Blue paint around the club on his return and the walls weren't the only thing to take on the colour. The second kit looked the same, not as much of a change as the previous season had introduced a more royal shade to both home and away shirts. Mike Whitlow was another defender in the Richo mould - tough tackling, honest and with bags of experience. Brought in as a captain, his forthright views earned him respect amongst the players but not the management when they conflicted with Gary Mills's who stripped him of the leadership and, on at least one occasion, sent him to the reserves. A leg injury cost him most of the season and a year later, he generously cancelled his players contract in order to allow the club to sign two new squad members and accepted a training position.. This shirt has by far the most interesting story of this season's kits. At the beginning of the season, the shirt had not been planned and it was only when a bad kit clash between Notts County and Bury meant that a third alternative was needed that it was hastily rushed into service. Again it took the same sort of styling as the home and away kit and had the same feel. Its main colour was yellow/gold but it had black panels down the side. In addition, there were all the usual things such as the new sponsor and Notts crest. The few that were made up were eventually auctioned off on Ebay after the disasterous 2005-6 campaign when the club belatedly realised there was cash to be made there. Occasional ones were sold off in the shop or given out as prizes. You may also find blank ones which were surplus to the clubs needs but which came in the same batch. These lack the numbering and name and don't have the plastic epaulettes either. a real rarity - the third shirt showing all the nice design and manufacture of the away kit but only available in limited quantity.